Growing up in the countryside of Virginia I heard stories of hunting in England and Ireland. Tall as bean stalks surely, but these tales still scared me witless. Yet they awoke in me a certainty that if I wore wellies and packed enough sandwiches I could swim my pony across the Atlantic in time for opening meet. The chance to fulfil my childhood fantasy came this Fall when my company sent me to train at the London office for a month. Two weeks into my residency, on a gloomy Thursday evening, I received an email from my good friend Megan Corp of Blackthorn & Brook titled ‘it’s now or never.’ So I bailed on my dinner with the Queen and hopped on the first train to Somerset. Megan’s hospitality began upon arrival. Remember those 4am wake up calls on chilly fall mornings when even the Jack Russell wasn’t enthusiastic? With Megan those mornings begin with a cup of tea, a smile, and a promise of ‘pony time’. The ponies may have been Irish, (and 17 hands if they were an inch), but the rest of the scene was more English than a Sunday roast. Breath-taking countryside, mossy stone farmhouses, welcoming hunt regulars, and Megan’s keen sense of the sport are just a few of a long list of reasons why my first day hunting in England will remain one of my most cherished. As all good things must come to an end, so too did my first time hunting in England. And even though I was from a different continent, (and one that barely drinks tea for that matter), as we left behind the Portman country, I felt like I was leaving home. The point I would like the make with these jabs in the dark at humour and imagery is that the pleasures of pastoral life, true horsemanship, and great hospitality are just a few reasons why time spent with Blackthorn & Brook is time spent in the best possible way. 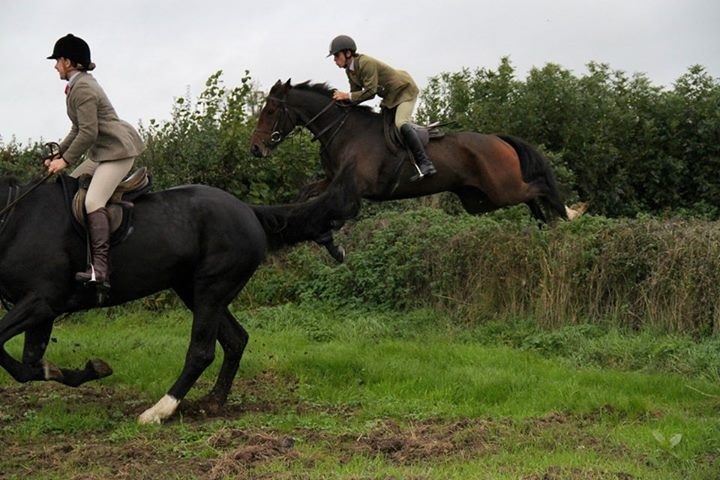 Philip storming over his first Dorset hedge, Megan on the point of landing. This entry was posted in Hunting Diaries Blog by Philip. Bookmark the permalink.